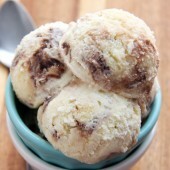 Creamy homemade Boston cream pie ice cream with swirls of pastry cream, chocolate fudge and chunks of moist cake. I have a love/hate relationship with good series. You get so into them that you want to keep reading one right after another. Even to the point of re-reading books for a refresher later on. And of course, watching the movies… because those are always likely these days. That’s me right now with Divergent. I reread Insurgent (because I absolutely needed a refresher) before moving forward with Allegiant. Then the Divergent dvd arrived… and I watched it twice in two days because it’s that good. How could I not? And I flew through the Four series (which btw if you haven’t read it yet and you loved the Divergent series… you’ll love it! Or at least I did). Now I’m in a post series sadness. I want more. Why didn’t she write more?! It should’ve been longer books and a longer series. Maybe like Harry Potter. Hey, a girl can dream, right? I’m sure all fans would’ve agreed with that though – more would’ve been amazing. Another something that I would’ve loved more of… this ice cream. It disappeared SO fast. That’s always a good thing though. A sure sign something is amazing. And that means you absolutely have to make it. 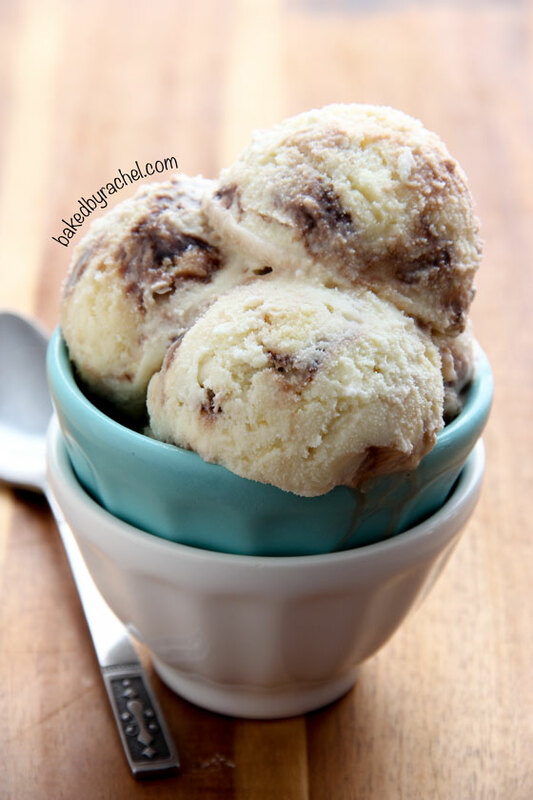 So be sure to add this fun ice cream recipe to your plans soon! 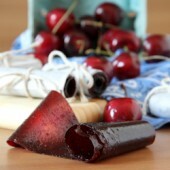 A classic dessert reinvented into a fun frozen treat. Creamy vanilla ice cream with swirls of homemade pastry cream, rich chocolate fudge sauce and chunks of moist yellow cake. 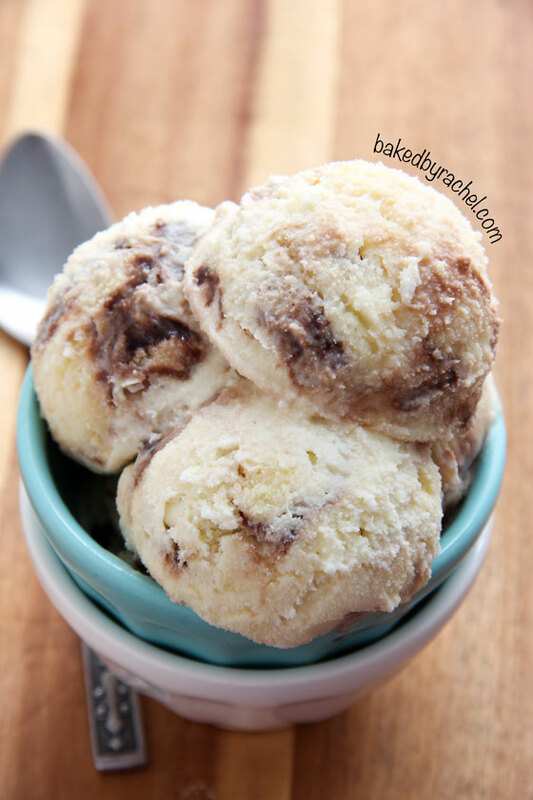 If you love Boston cream pie and ice cream, then you’ll definitely love this Boston cream pie ice cream! A perfect dessert for any time of the year! In a medium bowl, add 1 cup heavy cream. Place a mesh strainer on top and set aside. In a medium saucepan over medium heat, combine whole milk, remaining 1/2 cup heavy cream with sugar and salt. Stir to dissolve sugar. Whisk egg yolks in a small bowl. When mixer begins to steam, slowly drizzle 1 cup hot milk mixture into egg yolks, while continuously whisking. Pour mixture into saucepan, continue to stir and cook until mixture coats the back of a spatula or wooden spoon. Pour through mesh strainer into reserved heavy cream. Chill over an ice bath. Cover and chill thoroughly in the refrigerator, roughly 4-6 hours or overnight. Meanwhile, prepare desired yellow cake. Allow to cool and set aside until ready to proceed. Prepare pastry cream: in a medium saucepan over medium heat, combine milk and 1 tablespoon of sugar. Stir to dissolve sugar. Mix in flour, slat and vanilla, stirring to combine. Bring to a low boil. In a small bowl, whisk together egg yolks and remaining 1 tablespoon of sugar. Slowly add warm liquid to yolks, continuously whisking. Return mixture to saucepan, cooking for 1 minute. Remove from heat, add butter, stirring until all ingredients are incorporated and smooth. Press a sheet of plastic wrap to the top of the pastry cream, pressing down gently, removing any air bubbles. This will prevent a skin from forming. Set aside to cool. Cut cake into 1 inch cubes. 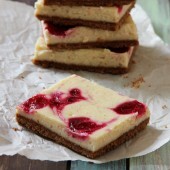 Place in a single layer on a baking sheet. Transfer to the freezer for 30 minutes. Churn ice cream according to manufacturer's directions. While ice cream churns, warm chocolate sauce to a liquid consistency then allow to cool. Create a bottom layer of ice cream in your desired freezer safe container. Alternate with layers of cake pieces, pastry cream and chocolate fudge sauce. End with a layer of ice cream. Do not stir. Cover and freezer until solid. I always feel empty when a good book series is over :) This ice cream look ahh-mazing! It’s so true. Hopefully I can move on easily but I doubt it. This ice cream looks so good! I love that it is an egg base too, that’s my favorite! I’ve never made my own ice cream (maybe because of or in spite of the fact that my first job was at a gourmet ice cream store), but I just may have to – this looks incredible! I’ve never seen those shows so I’ll have to take your word for it :) But I’m glad I’m not alone in the withdrawals. 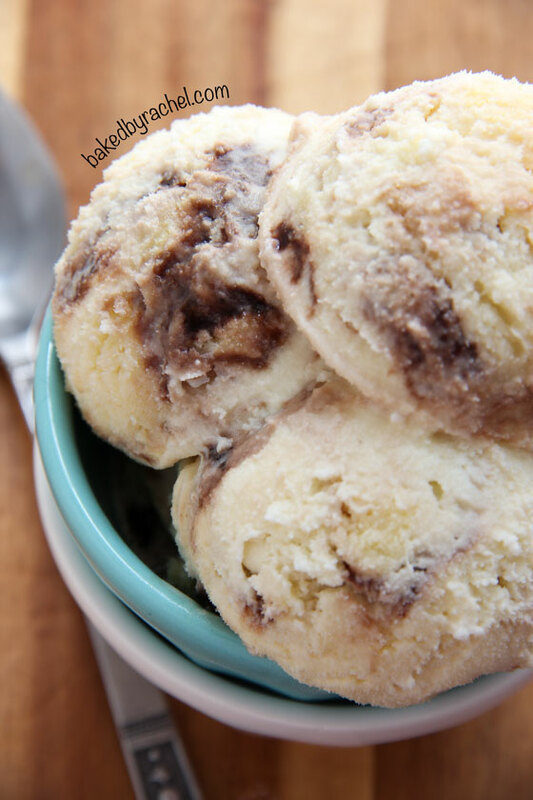 boston cream donuts are my absolute fave – so I’m pretty sure I’d love this ice cream!! Post series sadness: I totally know what you mean. I get that way too!I haven’t started the Four series yet. Can’t wait! This ice cream – OMG I’m dying. those pictures are making me want icecream NOW. i wish it was hot enough here to justify having ice cream! 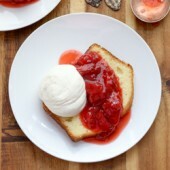 so craving a scoop right now..
Ice cream swirled with Pastry Cream?! Sounds to die!! Totally loving everything about this!